I hope you are well and having a great week. A big welcome to my newest followers - so happy to have you along! All the signs of Spring have disappeared, but at least Easter is on its way and that is part of Spring too. At any rate, if I can't start wearing shorts and tank tops, I might as well eat some chocolate eggs! lol A new challenge starts at Creatalicious today, and the theme is Easter. Remember, at Creatalicious you can make any craft you fancy as long as you follow the theme. This month we are sponsored by Scrappiness Designs and the lucky winner will receive a $6.00 gift certificate to spend in the store! The design team were provided with a choice of digital kits to create our projects and I chose Bunny Love. I have to say - for some unknown reason I thought it would be complicated to work with a digital scrapbook kit, but it was actually really easy to use and a lot of fun. 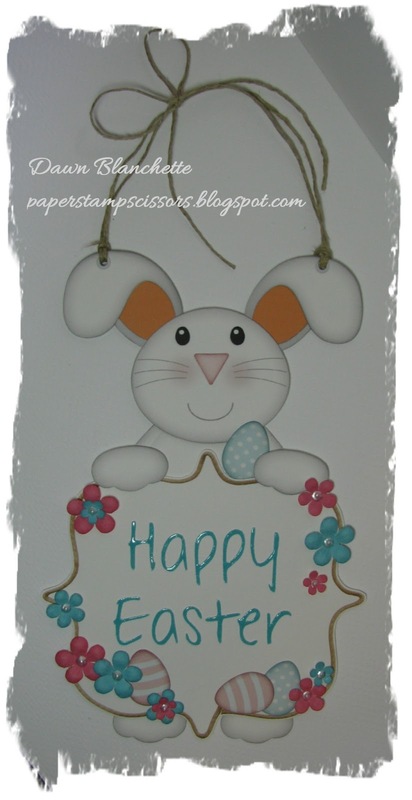 For my project I made a little Easter door hanger for my son. He loves it! I printed out this cute little bunny three times, along with several other elements from the kit and fussy cut all of them. With the extra bunnies, I cut out various parts and pieces, inked them around the edges and paper pieced them all back together to give it more dimension. The letters are a computer font cut with my cricut out of one of the papers included in the kit. I then applied glossy accents - looks like piping gel :) A couple of eyelets, some twine and a drop of liquid pearls in the centre of each flower and that's it! For more beautiful inspiration, be sure to pop by Creatalicious Challenges. Then get out your Easter stuff and join in the fun. We also have a colour challenge that still open for a couple more weeks, so check that out too. Thanks for popping by and for taking the time to leave a comment! I love reading them and having the chance to visit you too. I am a little behind at the moment, but will catch up with everyone over the weekend and I'll be back with my Playing in Paradise challenge post in a few hours. See you then! This is gorgeous Dawn. I love that bunny. The design is fabulous and the colour scheme is beautiful. A very pretty springtime make Dawn. So cute...Thanks for joining us at Fab'n'Funky this week. Your door hanger turned out great! That bunny is just too cute! Thank you for participating this week at Fab'n'Funky!